Riding in the back of a caravan, to the start of a two-day bushwalk, is a first for both of us. Everything is rattling and squeaking as we sit at the tiny table, clutching our backpacks to stop them flinging about as the unsprung van hurtles along at 90km an hour. What if the lovely couple in the car forget we are on board? We peer anxiously out the curtains. A few familiar landmarks whiz past and then the sign that indicates our turn-off. Our driver hits the brakes and the caravan bounces to a stop in the dirt beside the road. We tumble out quickly and thank Joe and Mary-Ann, before they speed off down the bitumen to their next touring destination. From our drop off point, it is about a kilometre to the start of the Giles Track. This is yet another stunning new landscape for us and an exciting new walk; a 22.4km track that cuts across Watarrka National Park from Kathleen Springs to the famous Kings Canyon in the Northern Territory. Before hitting the rocky track we fill up all our water bottles from the National Parks water tank in the Kathleen Springs car park, carrying enough water to last us overnight and into the next day. It is heavy stuff but the climb up onto the George Gill Range is an easy incline. After just 500m we veer off-track for a better view into Kathleen Springs. Below are a few day-trippers, wandering up the wide valley towards the green upper reaches of the springs. 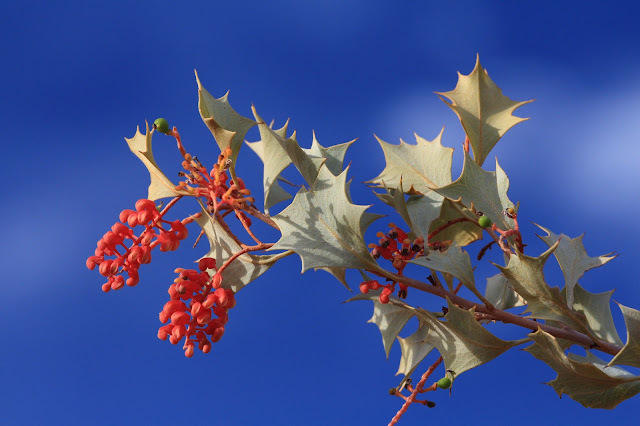 The flat, rocky top of the range is covered in holly grevillea trees loaded with bright red flowers. 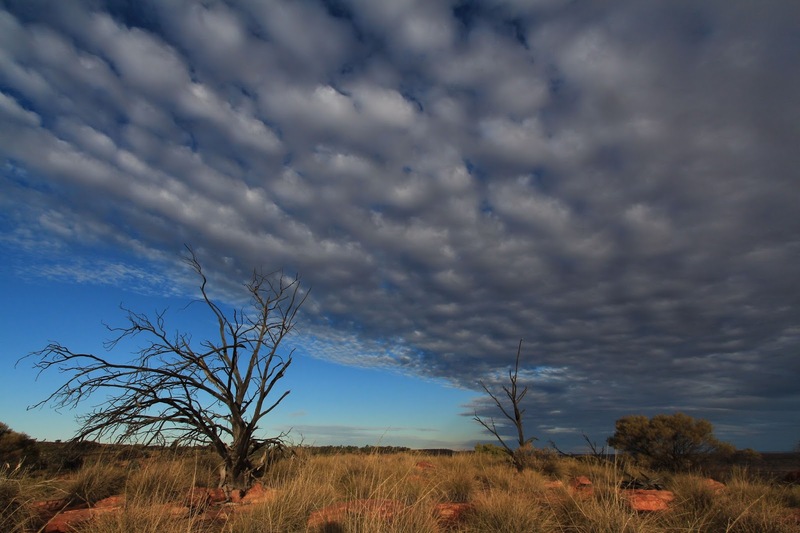 The track winds through clumps of tough spinifex and patches of caustic vine. It is beautiful walking and I realise this is what we have come travelling for - out of the way places, little known tracks, exciting scenery and new plants and animals. Several ephemeral creeks cut through the range and form short, deep gorges. The first one we reach is Wanga Creek where we stop to rest in the shade of a flood-busted river gum. A startled Spinifex pigeon scurries away across the rocks. 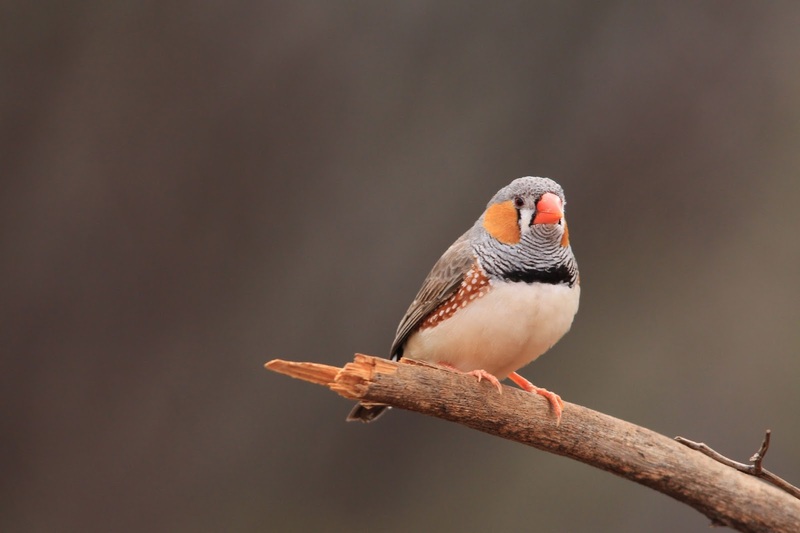 The remarkable patterns of its feathers give it a constantly surprised expression and a thin wisp of brown feather sticks from its head like a sprig of spinifex seed. Wanga Creek is too tempting to walk past. Leaving our packs in the shade we head downstream to explore. A few stagnant pools of dark water are tucked beneath shady ledges of rock but soon the sandy creek bed turns to long slabs of solid rock, worn smooth from an uncountable number of floods. We reach a series of ledges and climb down to reach the top of a spectacular dry waterfall. 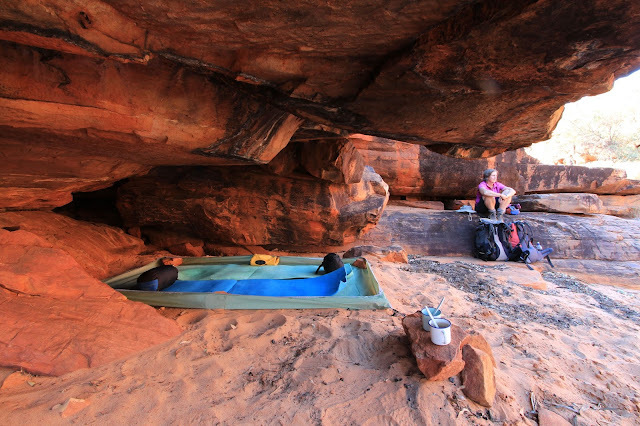 Below lies a dark pool of water and then the empty river bed continues on – sculpted in a near perfect half-pipe. Back on track, the joy of being out walking settles in with the easy rhythm of our steps. The track stays high and crosses two lesser creeks, both dry. There are a few lizards about – small red dragons that move fast over the rocks. Our route veers south and soon we are walking along the very edge of the range, with a small scarp of rock to our right and a vast, distant horizon to our left. The Giles Track is marked by orange arrows, set at intervals of approximately 500 metres, but we lose them for a moment – too focussed on getting a good look at some new honeyeaters feeding in the flowering grevilleas. About halfway along the track is another access point, near the Aboriginal community of Lilla. The Giles Track drops down off the range and nears the plains below. The Tjintjit Tjintjit Spur Track comes up from the plains. Where the two meet, we head north back up onto the range, first dropping down into Rocky Creek. It is quite dry but obviously a popular campsite. Walkers can camp anywhere between the 3km and 20km track markers, however the recommended place to camp is Reedy Creek, which is 8km from Kings Canyon but 14.4km from our starting point at Kathleen Springs. We push on through the growing heat, hopeful that Reedy Creek will have some water as the map shows it is a fairly large catchment with a deep, long-ish gorge. Despite the easy walking it feels like a long, hot slog inland. It is 2pm in the afternoon and the rocky, dry terrain offers no shade while walking. But, boy, is it worth it the extra push. When we reach Reedy Creek we dump our packs again and begin exploring downstream. After the dusty heat and glaring sun of the afternoon, what greets us is a secret oasis. The cliffs of the creek get higher and closer together. We step down a series of ledges to a large, nearly dry pothole. This then leads us through a narrow cleft, just two metres wide, between the rock walls. The cleft opens onto the edge of an amazingly beautiful waterhole. 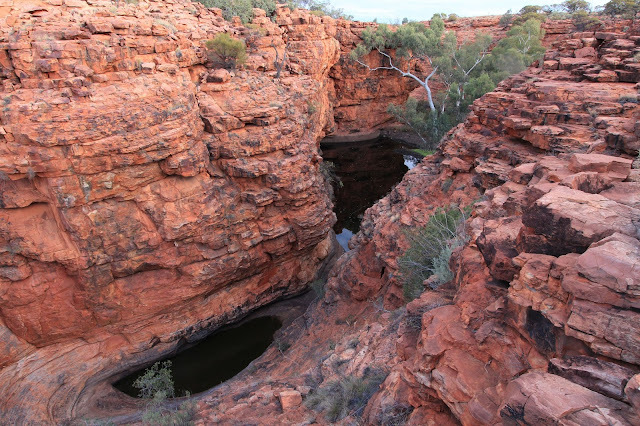 Cliffs around the waterhole tower 15-20 metres high. Across the deep pool is a gravel shoal where big river gums reach up into the light. The ground is covered in golf course green shoots. Sunlight, high on the red walls, is reflected perfectly in the black water. The magic of an oasis in this landscape is powerful stuff. We set up camp, back near the track, under a rock ledge. A perfect cave camp. The waterhole comes in handy and means we are able to extend our trip and plan a second night out on the track, closer to Kings Canyon. After a 14.5km day one, our second leg to near Watarrka Lookout, is a cruisey 4km. This gives us time to linger and explore the range as we walk. 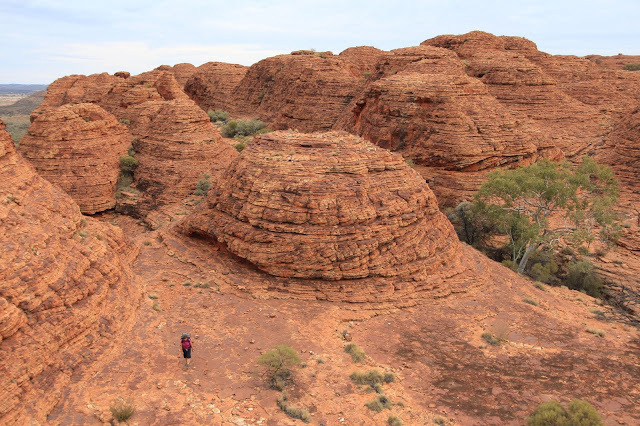 Just a a few hundred metres after climbing out of Reedy Creek, we enter a labyrinth of amazing beehive rock formations that are the real surprise in this landscape. 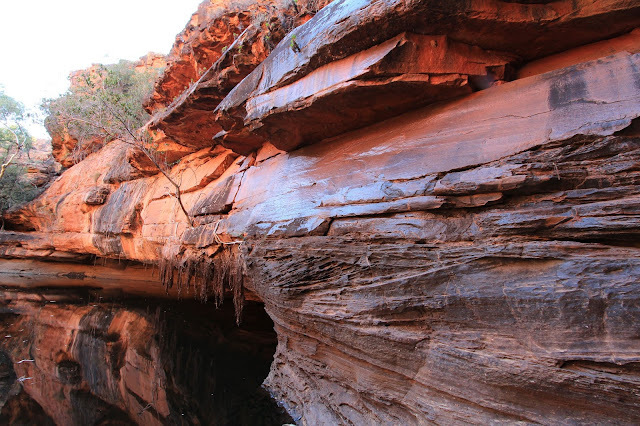 They look like pictures of the Bungle Bungles (Purnululu) in the Kimberley. 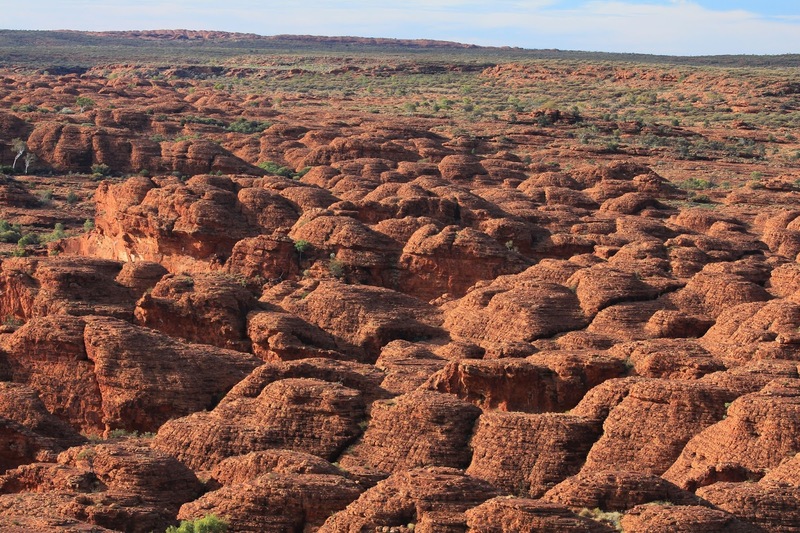 Domes of layered rock stand up to 10-15 metres high and the Giles Track weaves its way between them, through narrow alleyways and gullies. It is a beguiling landscape. We dilly-dally, enjoying the remarkable colours and textures. Unfortunately, the track does not venture near the high point of Reedy Creek Bluff Trig. We detour there anyway. Rock hopping and weaving through prickly spinifex brings us to a rusty old trig tower. There are great views along the edge of the range and across the top of the beehives. After this, we pick our way back to the track and begin a long, flat walk across the top of the range. There is plenty of holly grevillea beside the track and the skeletal remains of termite scoured trees. Across to the north are tempting views of a land of exploratory potential. Which brings me to the name of the track – the Giles Track, named after one of Australia's less well-known, and some would argue, least successful, explorers – Ernest Giles (1835-1897). I am looking forward to one day finding out more about this man. He crossed Australia from its centre to the west coast, naming the Great Victoria Desert as he went. He wasn't the first to achieve this crossing and so his exploits at the time earned him no reward and very little fame. He first piqued my interest when we were driving up the Stuart Highway. At a road-side stop in South Australia there was an information sign and map, with the tracks of all the famous explorers marked on it. 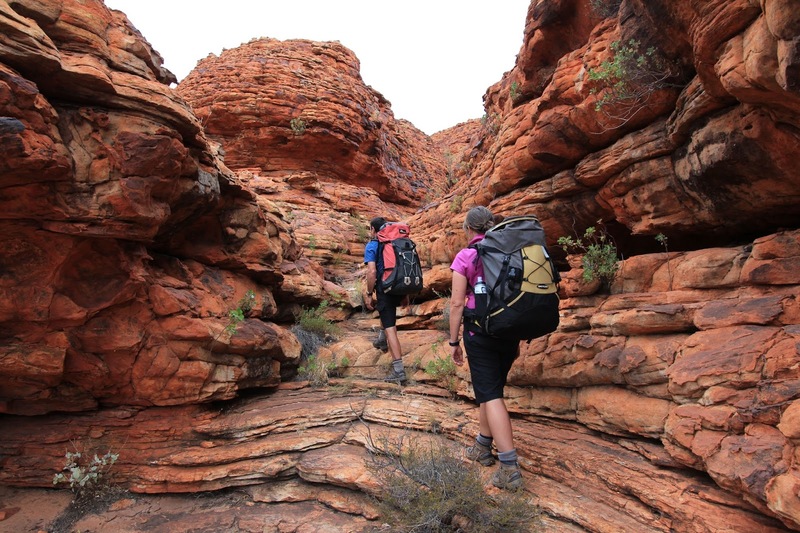 Most of their routes seemed to follow a similar course, heading through the wonderful Flinders Ranges or north along the big rivers and salt lakes of the channel country. But the little blue line of Ernest Giles went in a completely different direction. It ventured west of where we were standing. As I drove through the landscape he had thought to explore I had to wonder at the man's sanity. It seems he picked the hardest, emptiest, most desperate looking land he could find - dry and lacking in exciting distant features that might tempt an explorer. Nothing like the spectacular country in Watarrka though, and at Watarrka Lookout we enjoy our own bit of exploration on the Giles Track. Dropping our packs beneath the shade of the only decent tree, we wander down through a maze of rocky domes, gullies and ledges that make up this part of the range. Caz goes left down one gully and I go right. We meet around the back in a small, sheltered valley between the lovely layered dome rocks. An old cypress grows out of the meagre earth that has gathered in a shallow crack in the rocks. Caz climbs up the eastern face of one of the domes and I traverse around its base and climb up the other side. The rock is sculpted and worn into thin plates and strange mushroom-like shapes. Many pieces have worn away underneath, becoming separated from the main bedrock but still sitting in place unmoved and seemingly solidly attached. These weathered sections are fragile and so we keep our exploration to the hard, flat ledges and head back to the packs for an afternoon cup of tea watching the gathering clouds drifting in from the south-west. In fact, as night comes, we cop a few spits of rain that send us scurrying for another cave camp. Nothing comes of it though, the raindrops are big and fat but intermittent and gone within twenty minutes. The cave is stifling and dusty. It is nicer out in the open and so we drag all our gear onto a nice slab, pull the bivvy bags over our heads and sleep the deep sleep of weary explorers. It is nice when a popular tourist destination, famous the world over and crowded with bus tours, backpackers and caravanners, still offers the wilderness lover a chance to escape, alone, into nature. 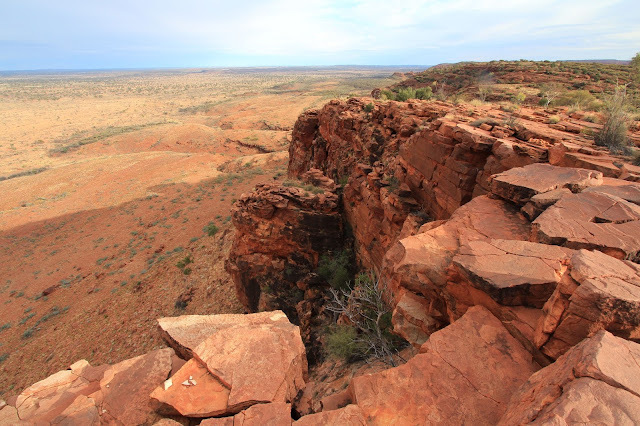 From Watarrka Lookout we follow the last 4km of the track towards Kings Canyon. Spinifex pigeons burst out from between the rocks as we clamber through the beehives and descend to the car park. A large Euro sends rocks clattering, as it bounds up between two domes and disappears. 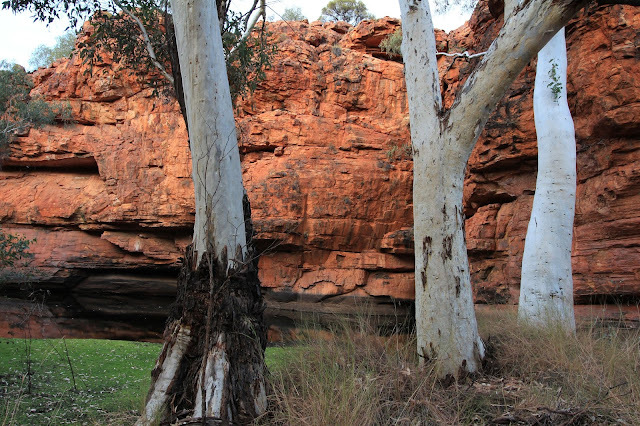 Cycads and ghost gums line small cracks in the rocks, which given eons, could be the beginnings of creeks and rivers. It is with a calmed soul, from two nights out on our own (we saw only one other solo hiker the entire walk), that we are able to quietly wander through the busy visitors area, past the free wifi point, dodging a large tour group as they tumble off the bus and head for the toilet block. We dump our packs beside the car, the walk complete - no fame or fortune for us either, not the first to have completed this feat either, but that hasn’t lessened the sense of discovery on the Giles Track. Always wanted to hike this trail! That landscape is incredible. Thanks for the post! Hi Neil, thanks for dropping by and reading the blog. The Giles Track was a real little gem. 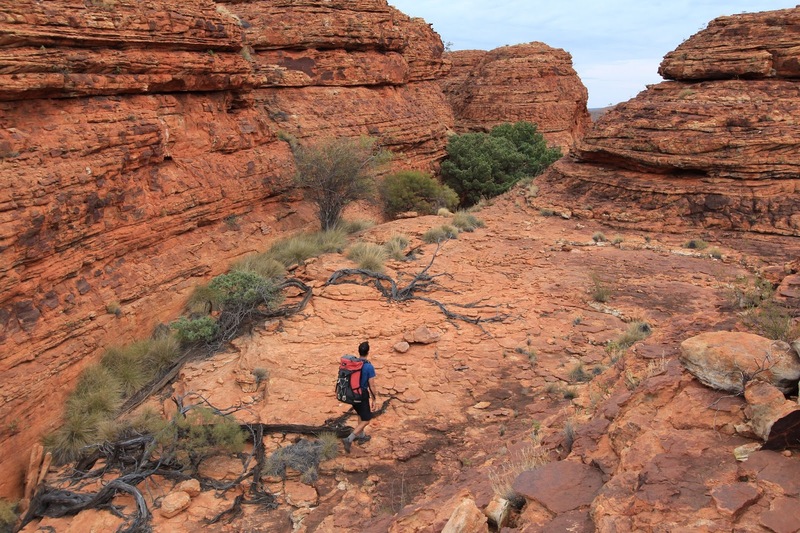 Central Australia is very under-rated as a walking destination - it is a stunning landscape. Hope you make it out there one day soon. Amazing place. Great to be out and alone. Trev is calling the UK the Pressure Cooker now. Awesome blog! I am going there in 2 weeks and doing the track overnight! Reading this has made me so excited! Did you have a tent or you were fine sleeping in the cave? Thanks Natalie. Hope you have a great time. We did not need a tent, but we were there later in the year than you, so always pays to check the forecast for rain. The cave/overhang was quite small!